Few of us that voted to leave the EU have enjoyed a day when it seemed crystal clear that the outcome of the referendum would be respected. Since the vote in 2016 I have not known one moment when there was absolute certainty we were leaving the EU. Straight after the referendum we had to endure weeks of abuse and hysteria from the media and all too many on the Remain side of the debate - not able for one second to enjoy the first ray of sunshine many of us had seen in years. Beyond this our establishment has tried every legal and political device to thwart the decision against a constant background of smears that somehow 17.4 million people were bribed by the Russians/Aaron Banks/Cambridge Analytica (tick one) to vote to leave the EU. One further piece of law-fare got under the radar this week, a week where the Labour party conference dominated the news. On Friday 21st September Scottish judges decided to allow the European Court of Justice to rule if Article 50 could be revoked by Parliament. So what? You may ask. Well this matters, it matters a lot. The Government still has the option of referring the decision of the Scottish judges to the Supreme Court (an ironic term when you think about it) but I wouldn’t hold my breath. Until now the understanding of Article 50 of the Lisbon Treaty is that the nation that invoked it could not unilaterally withdraw it - a sensible provision if you think about it since a nation could use the withdrawal mechanism as a form of blackmail to get its way over some aspect of national interest. Notwithstanding this, given the time and effort the EU would need to devote to the process it had to seem like a one way process to deter nations from invoking it lightly. The only way the process could be stopped was if all of the remaining nations agreed for this to happen, not impossible but one or two would probably prefer to see the back of a nation that had caused them so much trouble, in the case of the UK a nation that has been a royal pain in the backside since it joined. I don’t want to get into a Paddy Ashdown hat eating moment here but I am pretty sure the European Court of Justice will rule that Parliament has the power to revoke Article 50 effectively by-passing the other nations in the EU. What are the odds that this all happens at the time the Prime Minister returns to Parliament to vote on the deal - a deal the Labour Party has already stated it would vote against? The timing of this is highly suspicious (to me at least), the ruling is expected in December which is about the same time the ‘meaningful’ vote Parliament on the deal Theresa May has negotiated with the EU. Since the EU has been negotiating with someone who does not want to leave, the Prime Minister of Parliament that also does not want to leave there was never any pressure on them to offer anything meaningful. I have long argued that the simplest and easiest route out for us was by way of membership of European Economic Area (EEA) and then application to re-join the European Free Trade Association (EFTA). Time has pretty much run out of that option and we have a Prime Minister determined to negotiate her ‘Chequers Plan’ to a successful conclusion, a plan the EU has made abundantly clear is unacceptable to them. To be fair to the EU they have been consistent in their message about the single market that there could be no cherry picking, since the Chequers Plan seeks exactly that it is difficult to see what the Prime Minister hopes to achieve here. 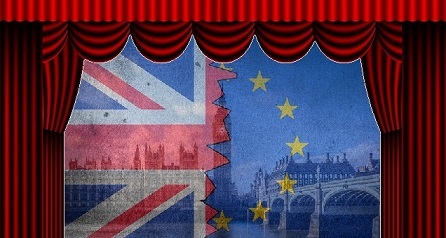 Now there are many Brexiteers that want to see a clean break with the EU and don’t care for Chequers or the EFTA option - that is a separate argument, what I think is going on here is theatre, my take on it is that Theresa May will return to Parliament with a deal she knows neither side will accept - an achievement in its own right. Parliament will perform a pantomime for the plebs and vote it down and with the clock ticking toward our exit without a deal in March 2019 Parliament will vote to revoke Article 50 ‘ in the national interest’ and the coup against the people of this country will be complete. Our establishment betrayed us by taking us into the EU in the first place; does anyone really believe they won’t try to pull the same stunt again? At least one thing, it will finally be as plain as the nose on your face that the people who own our country don’t actually live here.